Der Auslander: Is the Glass Half Full or Half Empty? "What does it mean is the glass half full or half empty?" Yep, someone in the United States is not clear on what that means. So, I gladly send you and anyone else interested in the topic of Motivation over to Despair.com, where you can find the lovely "Pessimist's Mug" pictured above and a variety of other things like de-motivational posters, calendars and books. 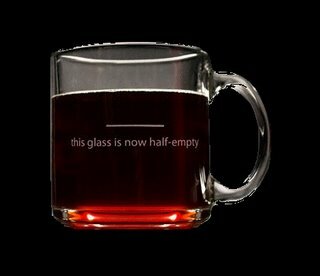 I would ordinarily tell you that "The glass is half-empty, now deal with it!" But with a treasure trove like this, I'm not so sure myself that things are so bad. As the company head says in his book, The Art of Demotivation, "it really could be worse." Really, you've got to check it out, especially if you have been down-sized, outsourced, etc. You'll want to send a few items along to the poor schmucks who are still toiling away at your old company. And if you have pesky employees of your own, check out the video on addressing employee complaints. I love despair.com! Their posters are great.